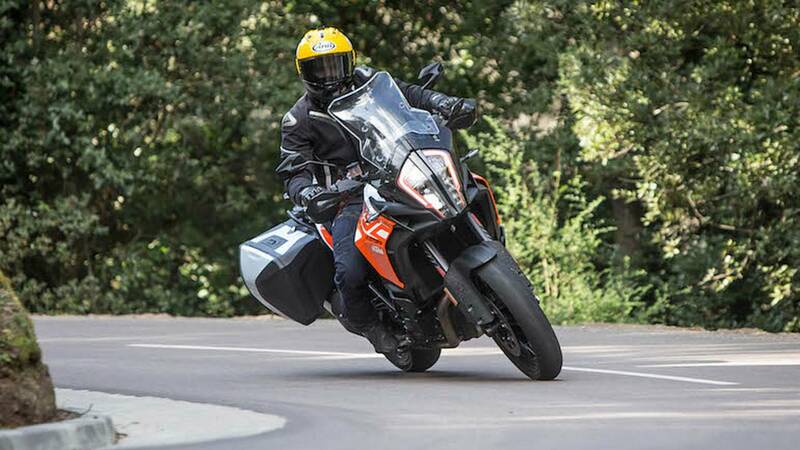 On the surface, the recipe for a long-distance adventure bike is a simple one: take a capable chassis with a large tank, add a big, torquey motor, sit the rider in an upright and commanding position, make sure there’s enough room to carry a passenger and a load of luggage (or no passenger and even more luggage), and call it job done. Put those things together and you'll find yourself with a bike that will do everything from traversing continents to cranking out your typical morning commute. But that isn’t quite the recipe KTM likes to follow. 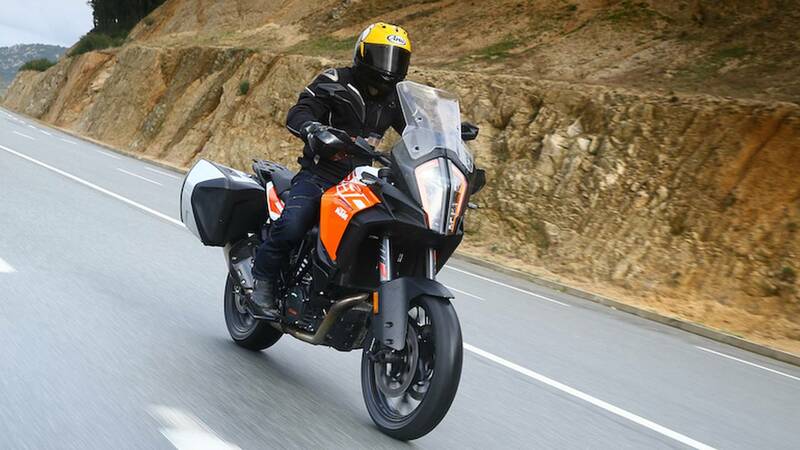 The twist in KTM’s recipe can be summed up by a quote from one of its engineers at the recent international launch of the 1290 Super Adventure S: "You might not need 160 horsepower in an adventure bike, but it sure is a lot of fun." 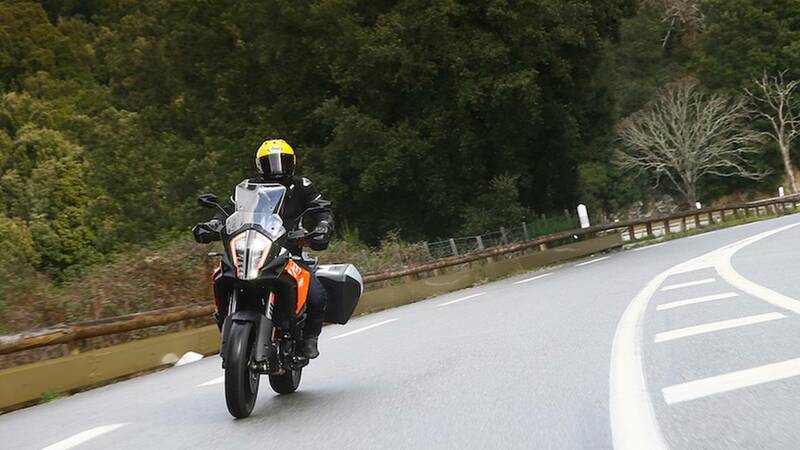 And I think that just about describes KTM’s culture: it builds capable bikes with a totally wicked side. 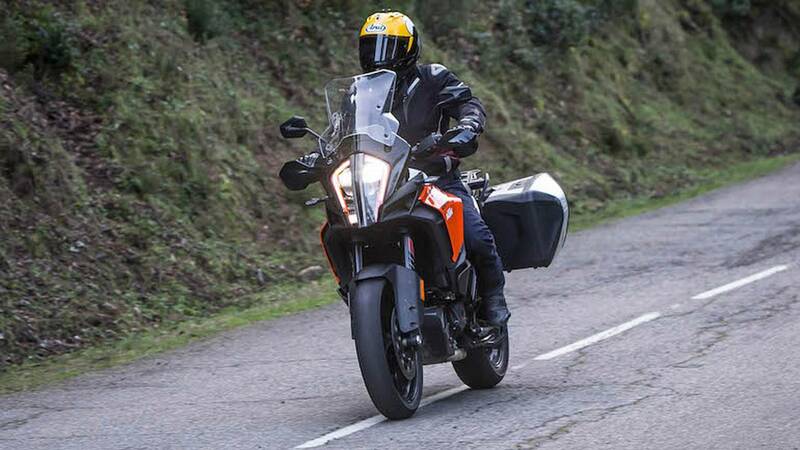 I felt a bit uneasy before climbing aboard the 1290 Super Adventure S. Not only because it’s a big, no-nonsense bike at 215 kg dry (474 lbs) – and I'm not exactly the largest chap around at 5 feet 9 inches tall and 61 kg (134 lbs) – but also because we were about to go and ride Corsica's roads. The French island's back roads are notorious for their twists, turns, and undulations. Indeed, Corsica is where Group B rallying came to a screeching halt in 1986 when Henri Toivonen and his co-driver tragically passed away on a deadly left-hander near the village of Corte, so the roads aren't to be taken lightly. Thankfully, the 1290 has more than a few tricks up its sleeve. 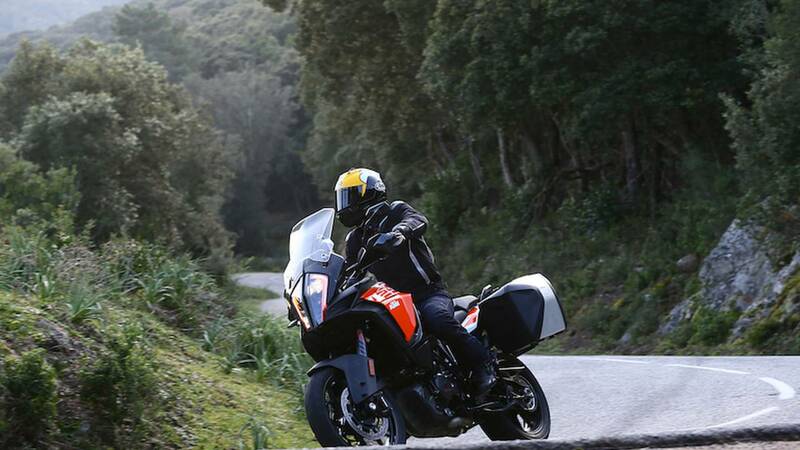 The 1290 Super Adventure S is packed with technology, both electronic and mechanical. There's so much of it you can almost be forgiven for overlooking the brute of a motor nestling in the bike's signature orange steel trellis frame. But more on that later. Like most bikes with a TFT screen, it's the first thing you notice. It's also probably the biggest such display currently fitted to a bike – at 6.5 inches diagonally, it's pretty much the size of an iPad Mini. 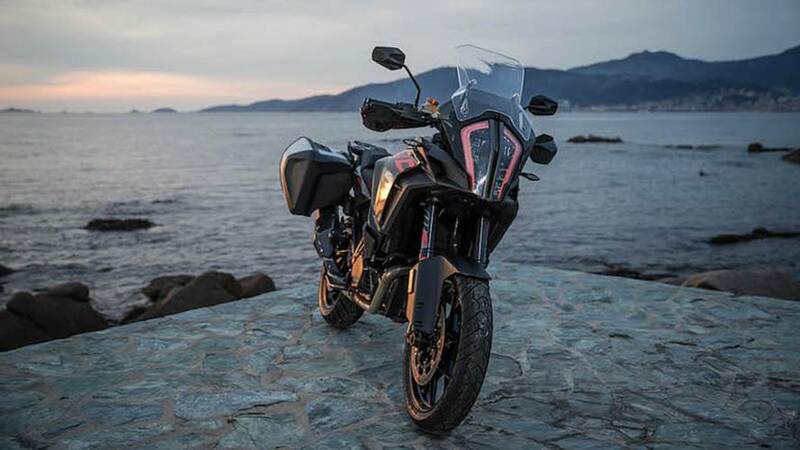 The bike features a keyless ignition system, which works – as you'd expect – on a proximity basis. You only need to be near the bike with the key for the "on" button beneath your right thumb to wake the bike up. Once you've done that, it takes a few seconds for the automatic steering lock to disengage and the bike's brain to kick into action. 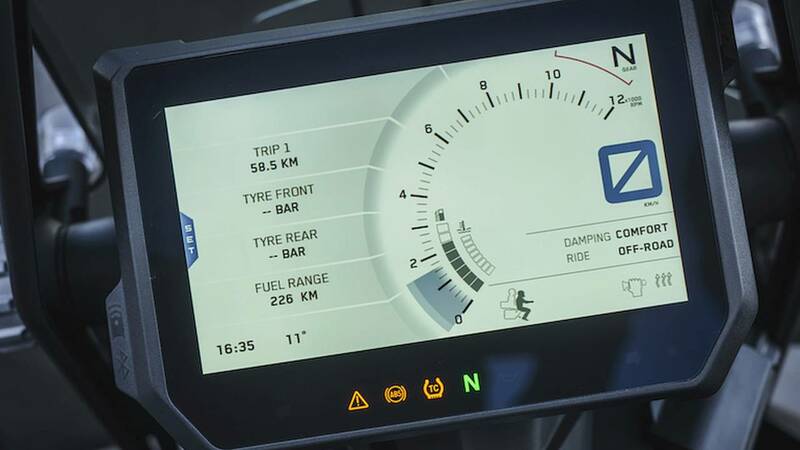 Once the bike is awake, the menu system on the dashboard display – protected by anti-glare gorilla glass – is clear and easy to use via the left-side grip's controls. It even goes to the trouble of alerting you to things like the kickstand being down, and is angle adjustable via a control under the screen. Like other bikes with TFT displays, it switches between low- and high-contrast mode depending upon ambient light conditions. Usefully, the handlebar controls illuminate in the dark. I slipped the bike into Road mode (other modes are Sport, Rain and Off Road), which offers sensible amounts of throttle response and traction control, and made sure that the ABS level and suspension modes were set appropriately. I opted for Street mode for ABS and traction control, with the shock preload set to "solo" from a choice of solo, solo with luggage, passenger, and passenger with luggage. 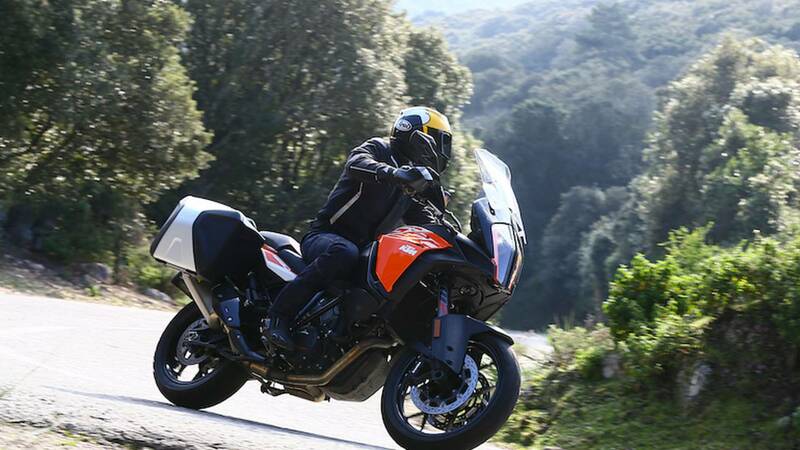 It took all of 500 yards before the 1290 Super Adventure S revealed its first trick - hill-hold control - as we stopped before a mini-roundabout on a slight incline. It's a welcome addition on such a large bike, even if I could get both balls of my feet down with relative ease. The rear brake held the bike leaving me free to simply pull away again, and I genuinely now want this feature as standard on every bike. As we left the Corsican capital of Ajaccio and the roads began to open up, the active suspension started to make its presence known. As you brake, the bike does not dive as weight transfers from back to front – as it would on a conventionally suspended bike. While this does remove some communication from the chassis and tyres, it also culminates in an incredibly solid, sure-footed feeling as you brake into corners and fire out the other side. It constantly adjusts, too, as the road surface changes. I won't claim to have noticed these adjustments, but I can tell you that the bike felt unflappable on any surface and in any condition it encountered. It's worth noting that in Sport mode, brake dive is restored and the previously lost communication through the tires and chassis comes flooding back. Soon we discovered how Corsican roads earned their reputation. We hit an endless set of corners, never once coming up for air. Whoever built this road had completely dropped "straight" from their vocabulary. It was so intense other riders complained of motion sickness when we stopped for a coffee afterward. These corners meant a constant dance between second and third gear, which served to highlight more of what the giant KTM was capable of. The quick-shifter works both up and down the gearbox, leaving the rider free to concentrate on braking and picking a line through the corner. 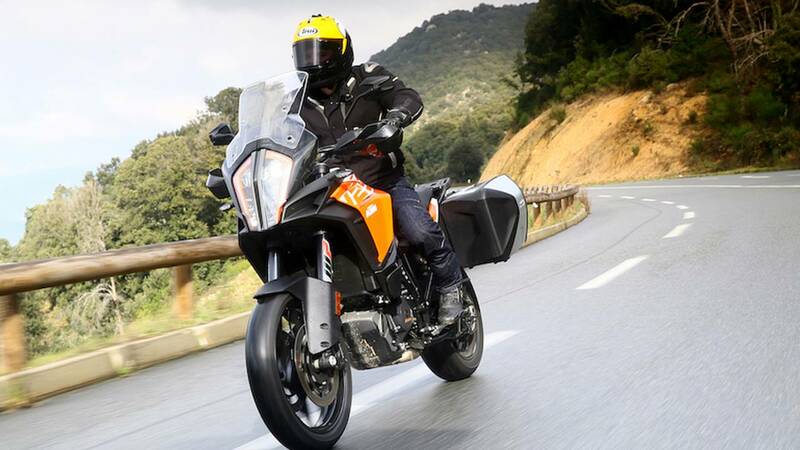 The throttle has to be closed for a down-shift, and up-shifts work beautifully under a slight amount of throttle load, plus the bike's clever enough to know when a gear has actually re-engaged, meaning it's super smooth in both directions. The 1301cc V-twin engine is fitted with what KTM calls "Motor Slip Regulation," which prevents the rear wheel locking on aggressive downshifts by slightly opening the throttle on your behalf. The 6-axis IMU (Inertial Measurement Unit) was given plenty to think about as it adjusted the cornering ABS and traction control on the fly depending upon the angle of lean. We were encouraged to push the limits, and we did - far too much front brake can be asked for mid-corner and silly amounts of power can be put down on the way back out... and it all gets shrugged off as if that's how you're supposed to ride. It's inspiring stuff, and makes you feel 10 times the rider you actually are. The 6-axis IMU is also responsible for operating LED cornering headlights. Just like TC and ABS levels are adjusted with lean, three banks of lights are illuminated bank by bank as lean angle increases. The engine is a topic all its own, and it's hard to encapsulate in words just how good it is. In Sport mode, twisting the throttle is comparable only to detonating a nuclear bomb. Torque is available absolutely everywhere and it spins up freely - it is decidedly not an old-school, lumpy V-twin, despite its huge capacity. I can happily confirm that the KTM engineer was correct: you really, really don't need all that power, but boy is it a lot of fun. Even more surprising was the Scorpion Trail II tyres could deal with the abuse being sent down the drive-chain. It's a chain final-drive by the way, not a shaft drive as many other adventure bikes are, so... uh... carry lube. By 3,000 rpm it's already making 73 lb-ft of torque (peak is 103 lb-ft) - and in any gear below 4th it'll pretty much wheelie on demand if traction control has been dialled down. Combined with the quick-shifter it's a wicked combination: you rip through a gear, tap the lever up, and do it all again – only even faster, with an even bigger, more stupid grin on your face. And then you remind yourself that you're sat on top of an adventure bike, not a sportbike. Meanwhile, in Rain mode, which saw use in the afternoon, throttle response is gentle and refined, restoring law and order amongst the 160 angry horses just waiting to escape at any opportunity. 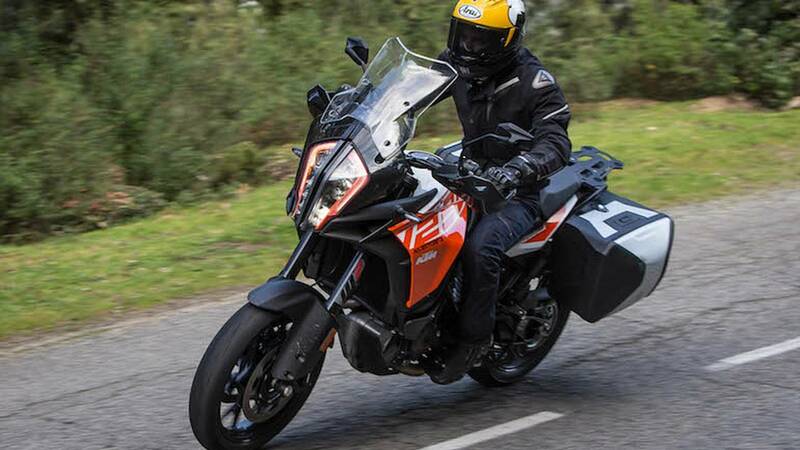 The 1290 Super Adventure S is an adventure bike after all, so there's lots of adjustability and practicality. The panniers are mounted to a 'floating' system that reduces buffeting and other movement from being transmitted to the chassis. Old sport-touring warriors may remember that Triumph's Sprint GT used the same system. We didn't get to silly speeds on the ride, but throwing the bike between corners didn't produce any noticeable movement or disruption from the panniers. Bars, footrests, and gear lever peg positions are adjustable, and there's a waterproof pocket to store and charge your phone via a USB socket. The screen is height adjustable and – importantly – it's adjustable while on the move. There's no need to stop, nor levers to lock into position, and there's an adjuster on both sides for convenience. My only annoyance during the day was the keyless ignition system. 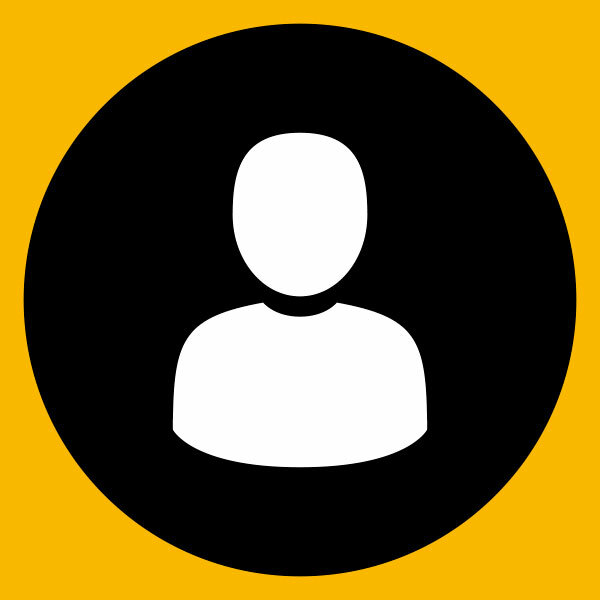 There's an understandable delay between pressing the "on" button and the display waking up, but while that's happening there's no feedback to let you know that your request has been acknowledged. This prompts you to press the 'on' button again in case you didn't press it correctly or for long enough, but what this actually does is turn the bike off - again with *no* feedback whatsoever, leaving you stuck in a cycle wondering what the bike is doing. Is it turning on? Turning off? Is it even listening? This caught out a number of us including the KTM technicians on hand. While I'm sure you'd get the knack after a while, it's certainly frustrating when it does happen. 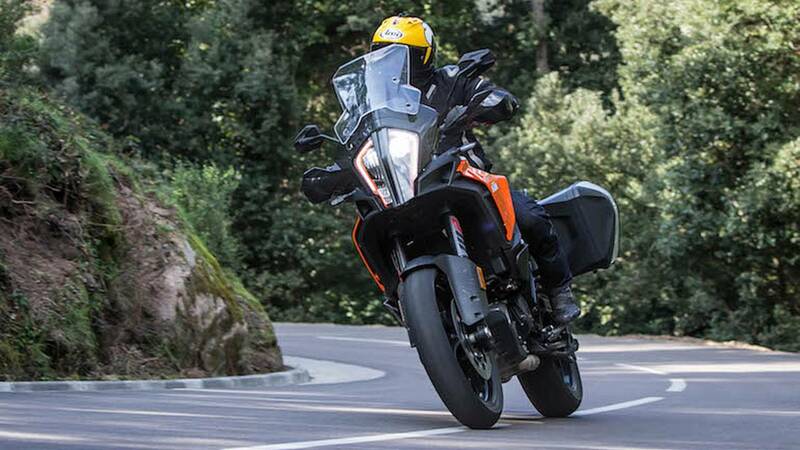 All in all, the 1290 Super Adventure S is an immensely capable bike. It's smarter than you are, has a motor capable of thrilling a rider of any level, and packs every feature you could ever want - you name it, it's got it. If you're lucky enough to live in the United Kingdom, prices start at £14,299, or €17,190 in the EU.